Find out how to become a patient. Learn about the future Health Education Campus. 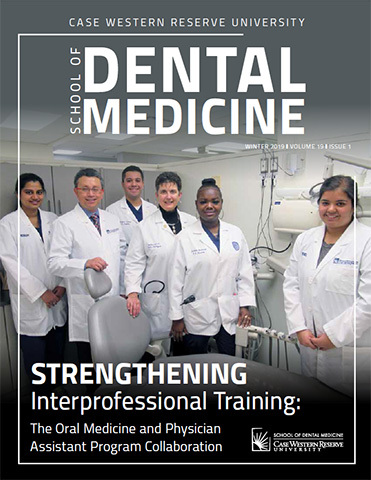 See how to become a dentist at Case Western Reserve University. This spring, the four-story, 477,000-square-foot building opens to 2,200 students from Case Western Reserve’s dental, nursing, and medical schools, including those from Cleveland Clinic Lerner College of Medicine. The Samson Pavilion expressly encourages interaction, surrounded on all sides by each floor’s open walkways and a wide staircase at every corner. It also features a dedicated shared space for students from all programs to study and relax. The Pavilion’s extensive technology features include: two distinct digital anatomy programs, one using mixed reality, and the other virtual; simulation programs for flight nursing and ultrasound training; visualization tables that allow students to see anatomic structures in precise detail and explore clinical cases with classmates; and large LED wireless touch screens in classrooms that allow students to interact with high-resolution images and easily participate in video conferences from around the world. Dr. Anita Aminoshariae of the Endodontics Department was featured on ABC News 5 on their January 31st broadcast. Dr. Aminoshariae discussed opioid pain relief and her opinion that dentists should never consider opioids their first choice in pain management, when over-the-counter drugs can be just as effective with fewer side effects. According to the ADA, dentists have been writing fewer opioid prescriptions over the 5-year period since 2012, but there is more that can be done. As if lung cancer, emphysema and heart disease weren’t enough, there’s more bad news for cigarette smokers. CWRU SODM researchers have found that smoking also weakens the ability for the dental pulp in teeth to fight illness and disease. “That might explain why smokers have poorer endodontic outcomes and delayed healing than non-smokers,” said Anita Aminoshariae, associate professor of endodontics and director of predoctoral endodontics. Thirty-two smokers and 37 nonsmokers with endodontic pulpitis—more commonly known as dental-tissue inflammation—were included in the study. One interesting find, Aminoshariae noted, was that for two patients who quit smoking, those defenses returned. The results of the study were published in the Journal of Endodontics (PDF). A new $1 million gift from the Delta Dental Foundation will help furnish Case Western Reserve University’s School of Dental Medicine with an array of new equipment to better serve patients. The Delta Dental Foundation investment marks a long-term partnership in the future of academic dentistry at CWRU. New research shows that the body’s own microbes are effective in maintaining immune cells and killing certain oral infections. A team of Case Western Reserve University researchers found that antibiotics actually kill the “good” bacteria keeping infection and inflammation at bay. Pushpa Pandiyan, an assistant professor of biological sciences in the School of Dental Medicine, led a team of researchers to examine “resident” bacteria, their fatty acids and their effect on certain types of white blood cells that combat infections in the mouth. They found that those natural defenses were very effective in reducing infection and unwanted inflammation—and antibiotics can prevent such natural defenses. Their work was recently published in Frontiers in Microbiology. She was joined in the study by dental school research staff Natarajan Bhaskaran, Cheriese Quigley, and Elizabeth Schneider, and students Clarissa Paw and Shivani Butala. Past issues of the magazine and issues of departmental newsletters are available in the archive.